If you haven’t seen it already, it is worth reading Joanna Jones’ piece on Medium about how the Oakland Museum of California developed and then abandoned their social impact statement. One of the central identity problems non-profits face is generating statements of mission, goals, etc that are meaningful and alive for the organization. Creating these statements is seen as a necessary evil for strategic plans, grant applications, etc and are filed away until it comes time to revise them for the new strategic plan or copy it down on a grant application. Focus groups asked whether a museum could really solve the problems contributing to the lack of equity and caring in the city. The museum’s internal stakeholders also questioned the viability of the statement. The museum invited six experts on social impact to spend two days participating in convenings and museum activities. While these experts were excited and energized by the reach and inclusion of museum events, they too were skeptical about the social impact statement. They wondered how the museum could ever meet the myriad concepts people would have about what equity and caring looked like. Rather, we simply needed to articulate the problem our community is facing that we are uniquely suited to address, the best solution we believe exists for that problem, and the concrete and tangible outcomes we’re going to measure that will demonstrate our positive social impact. The problem we’re trying to solve is social fragmentation. The community of Oakland is presently undergoing significant fallout from inequities within institutions, the state, and civil society resulting in a decline in social cohesion and an increase in social exclusion. Our contribution is facilitating greater social cohesion. What I valued about this piece was the discussion of the process they went through to come to this realization. There are statements of purpose non-profit organizations are obligated to have. There are some statements/actions organizations may feel self-obligated to enact in order to adhere to trends or to remain relevant. But these may not be relevant or constructive to the developing organizational identity. I was glad to see they recognized that while it was valuable to enunciate a clear purpose, their statement didn’t necessarily need to conform to a specific definition. 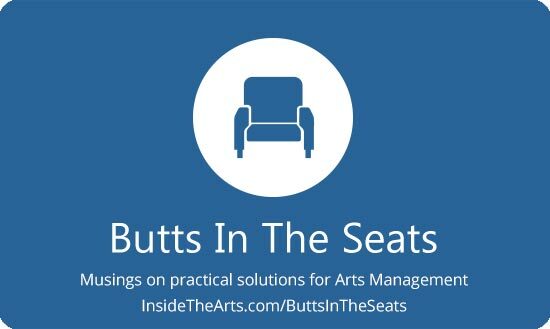 Americans for the Arts had a post on their blog last week that hit a lot of the right buttons for me. Steve Sanner and his partners have the Jiffy Lube franchise for Indiana. He writes about how placing murals on their buildings and becoming involved with other mural projects has benefited and redefined their business approach. He says from 1985-2015, he and his partners basically approached their marketing from the assumption that the advice of husbands, fathers and boyfriends were what motivated women to visit Jiffy Lube locations. Therefore most of their marketing was aligned toward men even though women comprised 50% of their customers. In 2015, we made a conscious decision begin speaking directly to women about the virtues of Jiffy Lube. We wanted women to know they could trust us to handle their maintenance needs and that they wouldn’t be subjected to chauvinistic or condescending mechanics. A chance encounter with an arts group put them on the road to placing murals on some of the 48 Jiffy Lube shops they own. The first three murals were designed as paint by numbers stencils so that community members could participate in their creation. A mural calling attention to mental illness involved flying a graphic novelist out from Seattle to hold panel discussions and resulted in a fundraising effort that benefited the National Alliance on Mental Illness. The first three murals attracted the attention of the Arts Council of Indianapolis with whom they partnered on six murals in 2018 with another six planned for 2019. Vehicles are going longer between oil changes and many only need one or two oil changes per year. This makes it easy to forget about your neighborhood Jiffy Lube. In addition, sign ordinances have become stricter, making it hard to identify our locations easily. By painting these murals, we are giving people an organic reason to talk about and pay attention to our stores. Internally, we have been surprised at how many artists we have working for us. Our employees are now showing off their own talents through sketches, vehicle graphics, and tattoo designs. We are planning museum tours and art classes designed to help our people further develop their artistic skills, understanding that this will help drive creativity in our own business. Employee retention is a huge issue for many businesses these days, and we are no exception. People want to be proud of who they work with and they care more than ever about the mission and purpose of their employer. The reason I growled was the outright instrumental positioning of the arts for medical outcomes. Author Christy Romer talks about the Arts Council of England’s (ACE) review of arts interventions where ACE regrets that arts organizations lack the funds to run randomised controlled trials and is therefore unable to justify the power of the arts to cure every mental and physical ailment under the sun. Repeating Carter Gilles mantra — just because you have method that measure something doesn’t mean the results you get have any relevance or relation to what you are measuring. It says there is a “growing recognition” among researchers that quantitative approaches like these “often fail to capture” the nuances of arts interventions, which become “lost in an overly narrow focus on data and measurements”. Broadening the focus to include more qualitative and mixed method techniques could make it easier to improve practice and integrate arts interventions more deeply into the healthcare and justice systems, it suggests. While it is good that there is a recognition that quantitative approach is too narrow and that the easiest measure is not the best, the fact is it appears they are still trying to figure out how to use the arts to fix things. It is important that researchers be able to discover that people with dementia may be helped by singing because it employs important neural pathways. But that isn’t so much a value of art as the fact that singing requires you to use specific facilities in the same way movement helps circulation. Yes, singing a song from their youth helps people with dementia to solidify their memories. But that is more an argument that our lives should be filled with creative experiences as much as possible when we are young. The same with the use of artistic expression to reduce recidivism among parolees. The article says “but says that because of the many factors involved, the “the challenge of demonstrating that a cultural intervention has had a measurable impact…remains daunting”. The thing is, if prisoners/parolees aren’t committing crimes after participating in arts related activities, it can be as much the fact they had an opportunity to socialize and were provided the tools to express themselves. There also may be other factors at work as well as they suggest, but if you think socialization and self expression are important elements in there, that is just more of an argument for people having the opportunity for creative expression when they are young. If you can’t clearly prove that opportunities for creative expression are reducing recidivism in a controlled trial study, are you going to take away their books and sketch pads? The value of arts is difficult to measure and define in a qualitative way. Creative expression is nuanced and not every mode of expression has relevance for every individual which means the it is impossible to arrive at a uniform application of arts as a cure. If people stop exhibiting violent tendencies after participating in a play, by all means try to figure out what elements of that experience may have contributed to it and try to provide those elements to others. Just realize you will never discover that 30 minutes of music every day will placate everybody’s anger. And you will never be able to identify every element that contributed to the decrease in anti-social behavior. For some it is the socialization, for others it is the opportunity to express, for others it is the kind word that someone said on the walk home that you never observed. There is a lot in this story that does well in recognizing that the current methods of measure aren’t capturing all the important nuances in creative interactions. However, by trying to find a new gold standard to measure the value of the arts, it still sounds like they are trying to distill something out of the arts into an easily applied elixir.